Hello everyone. I’ve decided that I would take some of the advice you all have given and make FOTD more of a weekly thing. I will do it when there is some kind of event or theme I can base a week of facts around. And for this week we’re going BACK...TO THE FUTURE? Why? Because the Cubs are in the NLCS. 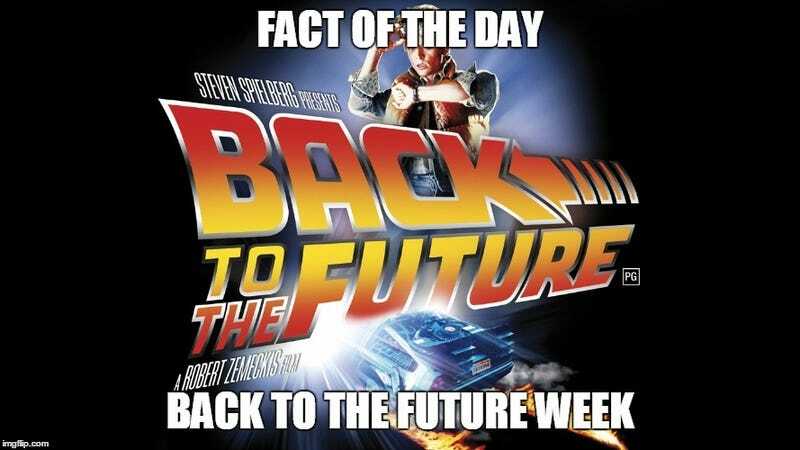 Seriosuly, that’s the basis behind a BTTF week. The Cubbies are playing in the National League Championship Series against the New York Mets. Since the Cubs win the World Series in the movie’s 2015, I figured it was as good a reason as any to discuss some fun trivia about the trilogy. First off, I am going to assume most of you know Eric Stoltz was originally cast as Marty McFly. They wanted Michael J Fox but the Family Ties producers would not let him have the time off to shoot the movie since he was the breakout star of the show. They tried with Stoltz but didn’t like how he played the role to seriously for a comedy. Eventually they worked out a deal with the Family Ties producers so Michael could get the part. Stoltz had already shot several weeks of footage which had to be reshot once they got Michael on the production. This blog post goes into more details and includes comparision shows between Fox and Stoltz. A quote from Producer Bob Gale discussed Eric’s acting style. Unfortunately, Eric Stoltz was simply miscast. “And he is intense, and he’s more of the method school of acting, and he’s a very internal actor, as opposed to a guy who has a lot of physicality to him.” said, Bob Gale. What you may not know is that there is still a scene in the movie where you can see Eric. It’s the scene in the cafe where Marty punches Biff. This video goes into details and includes audio from Tom Wilson from an interview he did. The show Fringe had an episode called “Peter” which showed a movie theater marquee with Back To The Future, but saying it stared Eric Stoltz. This is similar to one of the early Bioshock Infinite trailers which had a tear that led into a modern city with a movie theater showing Revenge Of The Jedi. Anyway, I hope you all found that as interesting as I did. I’ll be back tomorrow with more fun BTTF related facts. Have a great day everyone.